Blue-fronted Amazon parrots are colorful, talkative and sociable -- they make fun pets. If they're cared for well, they can live 40 to 80 years, making them loyal lifelong companions. They tend to be fairly easygoing and low-maintenance. They will molt periodically. If you know what to expect, you can determine when it's going to happen. Molting is a natural process whereby parrots get rid of old feathers and replace them with new ones. A parrot’s feathers can’t regenerate, so the parrot must periodically replace them instead. Your blue-fronted Amazon will not lose all his feathers at once while molting; rather, he will lose a few at a time and will molt symmetrically along his wings. In the wild, this would allow a parrot to continue flying and to stay warm. 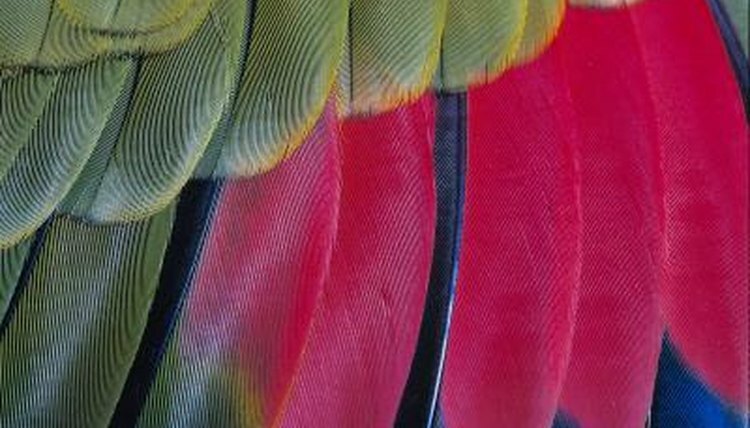 A parrot’s exact molting schedule will depend on the parrot's type, environment, and the amount of natural light he receives. Dr. Ron Hines suggests from personal experience that many parrots kept as indoor pets will molt several times per year because their circadian clock is not being governed by their natural environment. The circadian clock is a function of the pineal gland, and it internally tracks time so that birds know when to breed and molt. Molting can last from several weeks to several months, depending on the parrot. Your blue-fronted Amazon may seem more stressed than usual when molting, because he must expend extra energy to generate new feathers. He may be less talkative and sociable during this time, and he may seem more nervous or defensive. Make sure to give your bird plenty of quiet time, healthy food and a warm environment while he is molting. Although molting is a natural process, irregular feather loss or abnormal molting may be a sign of a more serious health problem. Sometimes blue-fronted Amazons will pick at their feathers when they are bored; to combat this, make sure your parrot is getting enough time to socialize and explore. He may also pluck his feathers if they feel dry and itchy, so make sure he has access to a birdbath. Some parrots, meanwhile, fall victim to psittacine beak and feather disease, which attacks their immune systems and causes their feathers to grow back abnormally after molting. If you notice unusual feather growth, contact your vet right away.